But Feld’s rise to the ranks of the world’s billionaires hasn’t exactly been meteoric. Feld has been working at it for 40 years and has controlled the Feld family empire since the mid-1980s. And a whole lot has happened along the way. Let’s take a look at the business proposals that made Kenneth Feld a billionaire. The 1970s were rough times in America. Nixon. Watergate. Ford. Accidental president. Carter. Energy crisis. To top it all off, Ringling Bros., and Barnum & Bailey nearly went bust that decade. In 1971, Mattel’s Ruth Handler decided to buy the Feld’s circus. She had the cash and a real knack for making and marketing Barbie Dolls and miniature pink Corvettes. But the people at Mattel knew nothing about running a circus. So Handler asked Irving and Kenneth Feld to stay on to manage the circus. While that was probably a smart move, bungles on the part of Mattel made it impossible to weather the tumultuous 1970s. And the decade came and went, Reagan came along and convinced Wall Street (and everyone else, for that matter) that everything was going to be “okay,” and in 1982 the Feld’s put together a business proposal to set things right. With $3 million of their own monies and a loan of $19 million, the Felds bought back Ringling Bros., and Barnum & Bailey. Business proposal #2: Disney on Ice! In 1981 – even before officially taking over the family business upon the death of his father, Irving Feld, in 1984 – Feld struck a deal with Walt Disney executives to bring a travelling ice skating production to cities around the world. At the time, the production was called Walt Disney’s World on Ice, but the name was changed to Disney on Ice! In 1998. Like everything else associated with Disney and Feld Entertainment, standards are ridiculously high for Disney on Ice! The productions, according to The Chicago Tribune, begin with meetings between Feld and top Disney brass a year in advance of hitting the stage. Feld and Co. look for trending characters and storylines across the Disney spectrum to bring to the stage. In the same article, Kenneth’s sister, Juliette Feld, says that one of the challenges in bringing beloved Disney characters to the ice is keeping it interesting for mom and dad. “If you come and bring your kids to the show, and it feels babyish, you won’t be interested in coming back,” Feld told The Chicago Tribune’s Becky Yerak. The Feld’s have apparently succeeded in executing this particular business proposal, as Disney on Ice! now runs in more than 60 countries, year after year. Here’s an interesting tidbit in light of the current outsourcing-crazed business environment. In the mid-1980s, Feld Entertainment was outsourcing its costume and set design. But Feld noticed that, while prices were going up, quality was going down. Feld made the bold move to bring costume and set design in-house, so the company could maintain higher standards of quality control. Now, Feld Entertainment makes everything involved in its operation, from costumes to railcars. “Today, we have the two longest privately owned trains in America. Each is over a mile long. We buy used railroad cars at auction, gut them, and retrofit them at our facility,” Feld told Inc.com. Over the years, Feld Entertainment has received plenty of criticism from animal rights groups, like People for the Ethical Treatment of Animals (PETA). Certainly, there are plenty of reasons to be concerned with the safety of the majestic elephant – of this, there is no argument. Feld Entertainment’s Sarasota, Florida-based Center for Elephant Conservation is a response to animal activists as well as a necessity for a circus dependent on Asian elephants, which have become virtually impossible to import into the United States since the 1975 Convention on International Trade in Endangered Species (CITES). CITES makes sure that trade in endangered animals does not further threaten any species of rare animal, and it presents challenges to Feld’s business. 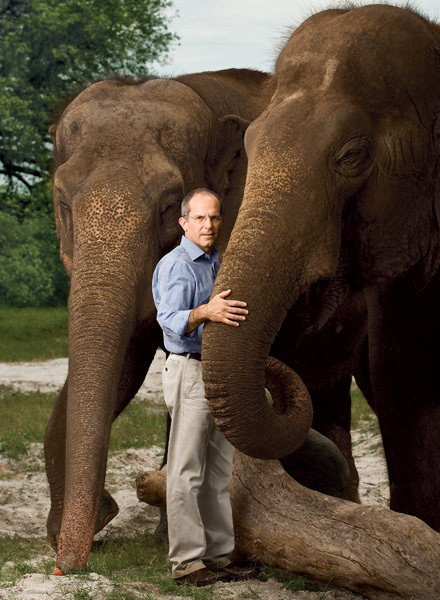 “With CITES, I knew if we didn’t do something, there could be a shortage of Asian elephants in the U.S. and kids wouldn’t have a chance to see these incredible creatures,” Feld told Sarasota Magazine. Since its development in the early 1990s, The Center for Elephant Conservation has become a major United States center for elephant research, healthcare, and sustainability, in addition to breeding. As you can tell by now, the circus is serious business. There’s a lot more to Kenneth Feld’s story, including CIA connections, wiretapping, and family feuding. While we can’t call him a saint, we can say that Kenneth Feld is one seriously interesting billionaire – and that’s quite a description, given that most billionaires are fascinating people. Our major takeaways here are that two-fold. Firstly, the Felds show us that a family business can break big (billion-dollar big!) with the help of clever business proposals. Secondly, Kenneth Feld has certainly never been shy about taking on big ideas and turning them into winning business proposals. Yet again, a billionaire in the spotlight shows us Quote Rollers that thinking big and being bold pays off. What do you think about Kenneth Feld’s business ventures (and his controversies)? We’d love to hear from you in the comment spaces below.